Memory Trip, the series of small gouache paintings on paper in this show, captures Michael Brophy’s deft ability to portray the Pacific Northwest region he knows well. Featuring 57 images, this show traces a four-day trip he made around eastern Oregon and back to Portland in 2006. Immediately upon returning home, he began retracing his steps in gouache, referencing the map he had used during his travels. The combination of immediate memory and a more long-standing familiarity with the region informs the iconic open spaces, deep canyons and valleys, striking bridges and a wide range of additional imagery in these paintings. 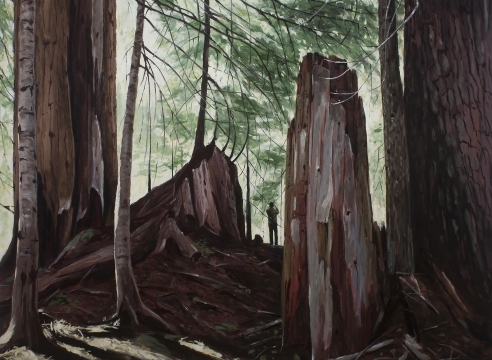 Northwest artist Michael Brophy graduated in 1985 from the Pacific Northwest College of Art, where he has also taught. He has shown extensively in the Northwest in both solo and group exhibitions. His work is in collections including Microsoft, the Multnomah County Library Collection, the Portland Art Museum, the Seattle Art Museum, the Tacoma Art Museum, OSU Library in Corvallis, and the City of Portland, OR. Public commissions include Portland’s City Hall, the Columbia Gorge Discovery Center in Wasco, OR, and most recently Mt. Ranier High School in Des Moines, WA.